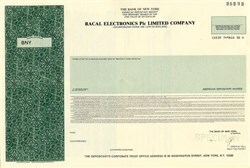 Beautiful engraved ADR specimen certificate from the Racal Electronics Plc Limited Company . This historic document was printed by United States Banknote Corporation and has an ornate border around it. This item has the printed signatures of the Company's Senior Vice-President. Racal Electronics plc was a British defence electronics firm purchased by Thomson-CSF (now Thales Group) in 2000. Racal was created in 1950 as Racal Ltd, the name being derived from the partners RAymond Brown and George CALder Cunningham. The first factory was located in Isleworth, West London. Although Racal had won a Royal Navy contract to build and supply a variant of the American Collins Model 51-J Radio Receiver, they were not granted a license to build these sets by Collins Inc. This meant that Racal had to design and build a radio receiver from scratch. The result was the justly famous 'RA17' - in production from 1955 to at least 1973 - designed in cooperation with Dr. Trevor Wadley and utilising his famed Wadley Loop circuit. In 1979, Racal bought Decca Radar forming Racal-Decca. In 1983, Racal competed for one of the original licences to operate a cellular network in the UK, both it and British Telecom were successful. Racal established the Racal Telecom (now Vodafone) subsidiary. In 1988, 20% of Racal Telecom was floated on the London Stock Exchange. This would lead to the situation where Racal Electronics was valued at less than its shareholding in Racal Telecom. Sir Ernest Harrison (Racal Chairman) demerged Racal Telecom in October 1991 forcing a positive valuation on the rest of Racal (colloquially known in the City as "the rump"). Vodafone would later become the largest mobile network in the world and the highest valued company on the FTSE 100. Immediately following the demerger, Williams Holdings launched a takeover bid for Racal. The bid, valued at �740m, failed. In 1984, Racal bought Chubb, a security company that manufactured safes and locks. In 1992, Chubb was demerged from Racal and was subsequently taken over by Willams Holdings in 1997 for �1.3bn. Racal re-established a telecoms division with a major government contract in 1988 and the acquisition of British Rail Telecommunications in 1995. This division of the former nationalised industry owned telecoms infrastructure laid across the rail network. This telecoms division was sold to Global Crossing for �1 billion. In 1994, Camelot Group won the franchise to operate the UK National Lottery, Racal had a 22.5% share. After one of the founder shareholders, GTECH, was bought out by Camelot this stake increased to 26.67% which Thales continues to hold. With the 2000 takeover Racal became Thomson-CSF Racal plc and later Thales plc with the renaming of the larger Thomson-CSF to Thales Group.